This is a guest post by Kyle M. Bagley. How do I record that thing? Where does the sound come out? There are how many of you playing at the same time? Horns, as in saxes, brass instruments, and the like, can seem intimidating to an engineer not familiar with them. This series of posts will cover microphones to use, arrangement of the players, and specifics for miking and mixing each instrument. Horn sections can be made up of a variety of different instruments. An average horn section playing with a band could include 2-5 individuals, often each on a different instrument. Step one is deciding if the musicians will record playing at the same time or individually. This is usually mandated by the room, microphone availability, or band personality. In my experience, both as a trombone player and engineer, recording a horn section all at the same time gives both the tightest performance from the musicians and the best sound for the recording. A good horn section will latch on to each other’s note articulation and dynamics, making great live sounding recordings that could not be achieved through individual playing. If enough mics are available, the optimal recording setup has close individual mics on each instrument as well as mics placed farther away to capture the players collectively. The most common method of far-miking horn players is with a stereo pair of condenser mics, placed at least three feet in front of them. The distance can vary greatly. Listen for the balance of the instruments and room reverb/reflection. There is often a “sweet spot” in a room where the horns stand out, which you should listen for while the horn players warm up and check sound. Don’t be afraid to balance a section by having some players stand closer to the mics than others. This far-miking method is often not used in a “dead” room, one without much reverb, or if some players are much louder than others. In this scenario, players can be divided by baffles or put in corners so that they can still record at the same time, but with individual mics only. It is important to note that room mics often cause a problem when overdubbing parts, as it is impossible to isolate the players and tracks. However, recording solos after the horn section has finished their parts is very common. Remember to keep the room mics active! How you use the room tracks is wildly different depending on the tastes of the producer, the style of music, and how the tracks came out. In a room with lots of reflection, you can mix the tracks in lightly to use as reverb. Other projects use them more to have a larger section sound to cut through a thick mix or loud band. You could also switch between close and room mics in a complex musical arrangement to add depth or highlight parts. Even with great sounding room mics, close mics on each instrument are important for catching the full range and nuances of each player. They are also crucial for mixing, allowing you to adjust panning and volumes, as well as compress, EQ, or add effects to each. You can get a great trombone or trumpet recording with an array of mics and methods, including several low price options. As in many cases, the sound of the player themselves and the mic position are more important than the microphone in capturing a great recording. This article focuses mainly on close-miking players and individual sound. For more on miking a section or far-miking brass players, read Part 1 in the series. Sound coming out of a brass instrument is relatively linear, or directional. You can think of the bell of a brass instrument as a speaker. The loudest sound comes from the center of the bell, and the sound will get quieter and change somewhat as you get farther from it. There is also some sound that emanates from the bell itself, usually high frequencies. Changing the axis of the microphone, or pointing it at an angle rather the directly at the bell will drastically change the character of the instrument on recordings by varying amounts of these two sound sources. What kind of sound are you looking for? Consider this before you even set up a mic stand. Do I want a piercing sound or mellow? Bright or dark? Will the brass be loud, a focus of the music, or background? Moving lines or long tones? If you don’t know, ask the band. As stated above, the loudest sound comes from a mic pointed directly at the bell. This sound is also the harshest. As you get farther away, the sound will get quieter, more mellow, and individual notes and articulations will be less clear. A good range of close mic placement is from one to four feet away. It is also important to note that distance mixes in more room sound, which can be counterproductive if you are already using room mics. Pointing the mic off-axis will achieve some of the same results, but with a new set of variables. As you increase the angle of axis, you increase the amount of “bell” sound you hear, and decrease the direct sound. In this way, you can make a sound darker and mellower without decreasing the volume or increasing room sound.Many engineers consider it bad form to record directly on-axis. 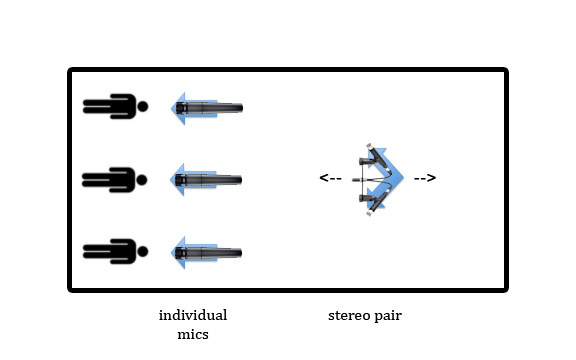 Another changing variable that comes with off-axis miking is wall reflection and bleed between microphones. As you point a mic off-axis, you are not only pointing it at a different part of the instrument, but a different part of the room. Is another sound bouncing off the wall the mic is now pointed at? The bell of an instrument is circular, so the angle is the same whether you point it up, down, left, or right. Consider this while setting up the room and other instruments. Many engineers will use foam around the mic or baffles between the players to avoid problems when recording off-axis. Be sure to explain your methods to the players, and give them an idea of what you are doing with the mic. As with singers, not every musician will know how to use a mic, and may think your placement is accidental or unimportant. Brass players, more than any other instrument, rely heavily on the musician, and not on the instrument for tone quality. The sound is actually created by the buzzing lips of the player, and amplified by the instrument. Understanding this is important for an engineer and how they interact with the player. A general go-to starting point for brass instruments is a small diaphragm condenser mic. They usually have a frequency response that is tuned well to brass, have good directionality to prevent bleed, and are easy to point and focus on specific areas of the bell. Again, price is not a huge factor here. I have a Sterling Audio ST31 ($99) that I love on brass instruments, and countless others have been used to the same effect. Large diaphragm condensers and vocal mics can also be used, although fine placement can be more difficult. Be sure to check the frequency response, so you are not boosting any areas of the sound that would result in tone. If no condensers are available, or they are being used for room/section mics, dynamic mics like the Shure SM57 will do just fine. Again, the players’ sound and the mic placement are far more important. Saxophone is one of the most difficult instruments to record. Engineers can easy fall into problems that will make the recording unusable or inadequate. The Saxophone is played with a reed, which is the small piece of wood in the mouthpiece of the instrument. As the player blows, the reed vibrates, making a sound which runs through the instrument. The pitch is then decided by which keys (holes) are pressed down top to bottom. The sound comes out of all open keys, with the highest notes coming out of all holes, and the lowest notes coming only out of the bell. The Sound Doesn’t Just Come Out of the Bell? No, the sound does not just come out of the bell! Unlike recording a brass instrument, putting a microphone down the bell of a sax will record only the lowest notes with clarity, and will have a very undesirable tone. Pointed at the center of the instrument, place a mic at least one foot from the bell, generally between one and three feet away. At close range, the clicking of keys as they open and close can be audible, sometimes ruining a recording. The farther away a mic is from the source, the less audible articulations and dynamic variation are, which may be important to the player’s sound. In simple terms, a closer mic will produce a more percussive “honk” sound, where a farther one will lose attack and create a “sweeter” sound. Also consider the sound of the room when placing a mic, as distance increases the reverb or room sound, which is counterproductive if room mics are also being used. Place the microphones directly on-axis to the instrument. Not doing so can create a sound with no real presence or articulation. For this reason, microphone technique on the part of the musician is very important. Turning or leaning (like to read music from a stand) can point the player away from the mic in a way that heavily alters the tone. You can use additional “spot” mics to support ranges that are not coming through well in the main mic, usually very low or very high notes. These are usually placed above or below the instrument, pointed towards the center. Whenever you use more than one close mic on an instrument, be sure to check for phase cancellation. Large diaphragm condensers are most often used for saxophones. They respond well to the range of the instrument and distance required for capturing a full sound. Similar to using these mics to record vocals, quality (and price) can be a huge factor here. Large diaphragm tube mics can add a “sweet” texture to a solid tone, making them a great option for saxes. 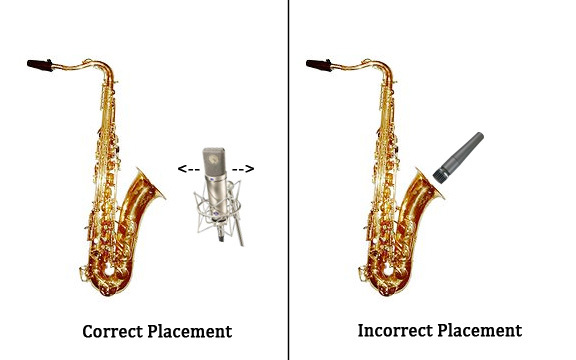 Small diaphragm condensers and dynamic mics like the SM57 are not the best option for sax, as they are more directional and make it difficult to capture the full range. If a dynamic mic must be used, an SM58 or other vocal mic is preferred.